Micro BNC 75 ohm straight crimp plug. This true 75 ohm plug is designed for Full HD 1080p applications and general use up to 12GHz. 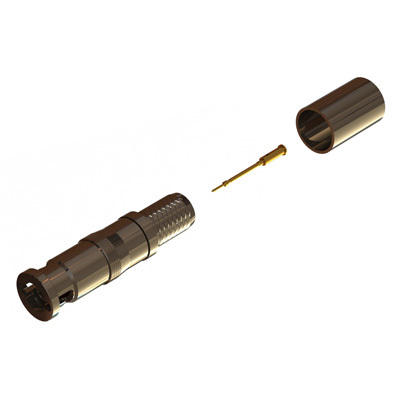 With gold plated centre contact and annealed crimp zones these connectors offer a long term durable solution. Suitable for use with Belden 1694A and similar cables in group FC. United States Patent No. 9,071.013 applies. Our Micro BNC 75 ohm connectors are designed for HD & UHD Broadcast, Telecom, HDcctv, Instrumentation and similar applications that require high performance in an high density package. The unique patented coupling nut allows the use of a special tool to disconnect the connectors when they are closely mounted. Tested to beyond 12GHz and exceeding the requirements of SMPTE ST 2082-1, these connectors are used in Full HD1080p (3G), HD-SDI and are fit for Ultra HD 4K (12G) applications. With a diameter of only 7.8 mm, mounting density is increased by 4 times when compared with a standard BNC. Suitable for Cables in Group FC - full cable information available here.